Now you can almost literally make history – by joining our multimedia #1917Live project to cover the year of the Russian Revolution in real time. 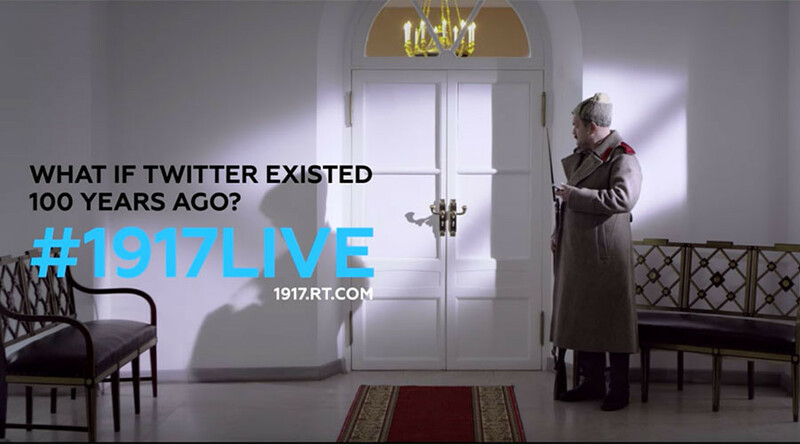 Just get a historical Twitter account and post under the hashtag #1917CROWD. From the start of the year, dozens of key historical figures, from Vladimir Lenin to Empress Alexandra have been posting about their views and actions as they happen under the hashtag #1917Live, creating a living history. However, not all views have been covered. If you’re a history buff, or just getting immersed in the revolutionary spirit (check out 1917.RT.com for more) you can now add your voice. The sharpest and most historically-accurate tweets will be highlighted by the Russian Telegraph, the main Twitter feed of #1917Live. Q: OK, I want to join the Revolution, what do I need to do? RT: Register a Twitter account, in the name of a historical person, whether high-born, a Menshevik or a disgruntled proletarian. Accounts of real figures are best (make sure yours isn’t taken already! ), but even fictional ones are OK. Just make sure they suit the era of 1917. We recommend taking up the role of an ordinary citizen of the Russian Empire – this will give you more historical leeway, and a better chance to get creative with your role in the Revolution. Upload this specially-designed background image in the description, put the line ‘#1917CROWD – member of #1917LIVE community’ or simply add the #1917CROWD hashtag. Q:I’ve got a user name and an account, what’s next? RT: Start researching, and get posting! Under each post please use #1917CROWD. The hashtag will allow other users to see your contributions; we’ll also be scanning it frequently to check for the best tweets. The more authentic your posts, the more attention you’ll get. RT: This is not homework, but if you want to contribute positively, your tweets need to be historically accurate, or at least plausible. Also please avoid swearing and abuse – that year was violent enough as it is, so let’s maintain at least some aristocratic dignity. Photos, contemporary paintings and artifacts are welcome. Q: I want to see more of #1917Live before I make my own red flag. Where can I do that? RT: The best starting point is the Russian Telegraph (link) though you can also search through Twitter, using the hashtags #1917Live and #1917CROWD. 1917.rt.com is also a rapidly-expanding trove of background information and media.